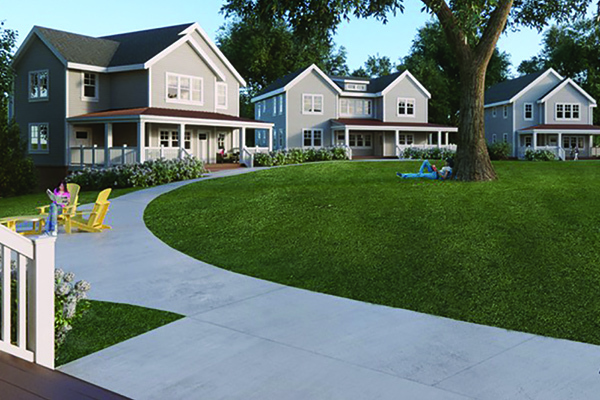 The Hollins University Board of Trustees has approved breaking ground on construction of Phase I of the school’s new student apartment village, culminating eight years of planning, design, and fundraising. The four houses that make up Phase I will be ready for residential students in Fall 2019. Hollins President Pareena Lawrence says the start of construction will be “an exciting and historic moment for Hollins” as the village will be the university’s first new residential housing in 50 years. The village will replace the university-owned student apartments, located across Williamson Road near the main entrance to the Hollins campus. Those apartments will close in late July following the conclusion of the university’s graduate programs’ summer term. Lawrence says Hollins is exploring options for re-development of the land where the apartments are located that will support the campus as well as the surrounding community and businesses. The four buildings in Phase I will feature eight units with 12 double rooms and 16 single rooms, accommodating a total of 40 students. Phase II, for which fundraising is under way, will consist of six buildings with 12 units, 16 double rooms, and 24 single rooms, making a total of 56 beds. Hollins worked with the architectural firm Hanbury of Blacksburg, Virginia, on the planning and design of the village. Richmond, Virginia-based EDC, which specializes in construction management services, will oversee the project, and G & H Contracting, Inc., of Salem, Virginia, will serve as the general contractor.